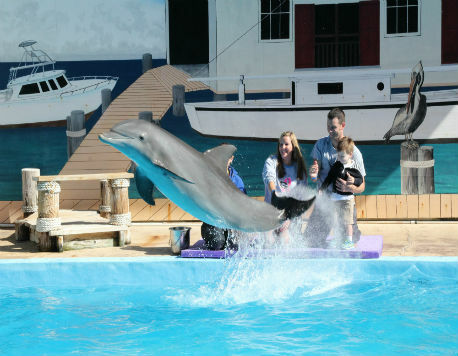 Play with some of the ocean's most lovable marine mammals with our Discovery Experience program! At Dolphin Discovery in Six Flags Mexico, you and your family can make friends with dolphins without getting wet. This fun interaction is designed for all ages and is perfect for a family vacation! Discovery Experience is a unique program at Dolphin Discovery in Six Flags Mexico. This program is unique because you interact with the dolphins from dry land. Unlike other dolphin experiences where you swim, this one keeps you dry so you can head off to your next vacation adventure right away! Because there is no swimming involved, this activity is perfect for everyone in the family, from young children to older grandparents. It is an experience everyone can enjoy together! From the sides of the pool, you will get to meet some of the funniest and friendliest mammals in the ocean. Our dolphins will give you a kiss, shake hands with you, and you can learn about hand targets with them. Because we book small groups for this program (less than 10 people), you will get a truly personal and interactive experience with the dolphins. Admission to this activity is $41.58 for all participants 2'11" and taller. Smaller kids are free, but must have paid admission to the Six Flags Mexico park. Children ages 1-8 must participate in this experience with a paying adult. The ticket price includes your fifteen-minute Discovery Experience program, lockers, towels, and showers. There are just four time slots for this experience per day, so book your spots now! Please note that, for your safety, pregnant women five months along and further may not participate in any of our dolphin experience programs. Pregnant women below the five month mark may participate only with another paying adult and after signing a release form. Please be sure to arrive at least thirty minutes ahead of your scheduled experience time. This time will be used to give you a quick briefing before you interact with the dolphins. Please be sure to wear biodegradable sunscreen as it will protect both you and our marine environment. Do not forget to bring your own towels and cash for taxis, food, and shopping. Please note that we are not currently taking American dollars at this location, only Mexican pesos or credit or debit cards. Please note that this experience does NOT include meals, snacks, photos of your experience, admission to Six Flags, or other admission activities within Six Flags Mexico.